Turmeric contains antioxidants, vitamins, and nutrients that are linked to over 600 potential health benefits. It’s a source of powerful nutrients that encourage normal joint function, cardiovascular health, colon health, brain function, liver health, and even prostate health. No other spice is as beneficial as turmeric! After 10 years of research, innovation, a new Raw Herbal Extract technology which follows the principle of separating and recombining all the elements of an herb, to produce the most powerful essence of its healing nature is being used to create Organic Liquid Turmeric Extract with black pepper. Energized Trace Minerals resonate with an energy you can only find in nature. While essential micronutrients are lost or destroyed in other extraction methods, we use a proprietary process that captures this energy. The natural cofactors and conutrients, along with over 80 trace minerals, provide the full spectrum of nutrition responsible for turmeric’s health benefits. Thanks to our revolutionary Raw Herbal Extract™ Technology, our turmeric is 100 times more concentrated than other leading brands. This proprietary technology gives you direct access to over 100 times more powerful antioxidants like curcuminoids. Curcuminoids are natural antioxidants that are 5-8x stronger than vitamin C and E and 3x more powerful than grape seed extract. They provide incredible antioxidant action that encourages cellular health, fights free radicals, and promotes longevity. 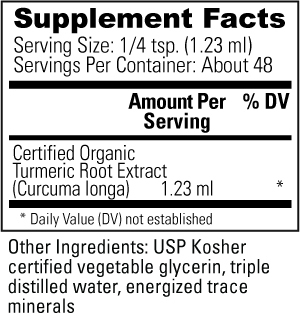 Inferior turmeric supplements often are sold with only profit in mind. This means they will use anything to cut costs and increase inventory. Too often, this is done by using toxic fillers that rip people off and make them sick. When you use cheap non-organic turmeric, the color can be dull and boring. To trick the consumer, some manufacturers will use artificial coloring to hide impurities. Absolutely and entirely natural. The only ingredients are organic turmeric root, organic black pepper, USP certified organic vegetable glycerin, triple purified water and energized trace minerals! Each bottle offers 48 servings of the highest quality turmeric extract you’ll find anywhere. Only the best organic turmeric root available is used in Organic Turmeric Extract with Black Pepper. You may notice slight variations in each bottle of our turmeric. While other companies use chemicals and dyes to hide the naturally occurring variations, we proudly embrace them. Variations in taste, smell, and color in our products serve as a proud reminder of the ingredients natural authenticity. Our turmeric is produced in accordance with Good Manufacturing Practices (GMP) to ensure quality and purity. Your satisfaction is 100% guaranteed with our generous 30 day No Questions Asked return policy. Take one serving, approximately 2 droppers, in the morning and 1 serving in the afternoon or evening, or as recommended by your natural healthcare practitioner. Q: Is organic turmeric liquid extract with black pepper extract all natural? A: Yes! We use only the highest quality organic turmeric! It’s enhanced with piperine and suspended in a gentle and safe vegetable glycerin base, no alcohol, fillers, or unwanted additives! A: Each bottle offers 48 servings. When used as directed (two servings per day), one bottle will last 24 days. Q: What does turmeric liquid turmeric extract taste like? A: It’s light and sweet with a hint of turmeric flavor. The taste is very gentle, it is not spicy or overpowering. Q: How should I store this product? A: Turmeric can be stored at room temperature but many people do refrigerate the bottle they are currently using.